That's the state we will bring you in on this Kozzmozz birthday edition. Our time capsule will zap you through space and time, from the past and the present, to the unwritten future. Give in to the energy of our beats and you'll be propelled through the tunnels of time. The Kozzmozz spaceship embarked on its maiden voyage into the universe of techno in 1995. During the past 17 years it has explored and conquered all different shades and evolutions within the genre showcasing a wide range of big as well as up and coming, international guests and Belgian talents in several great venues. 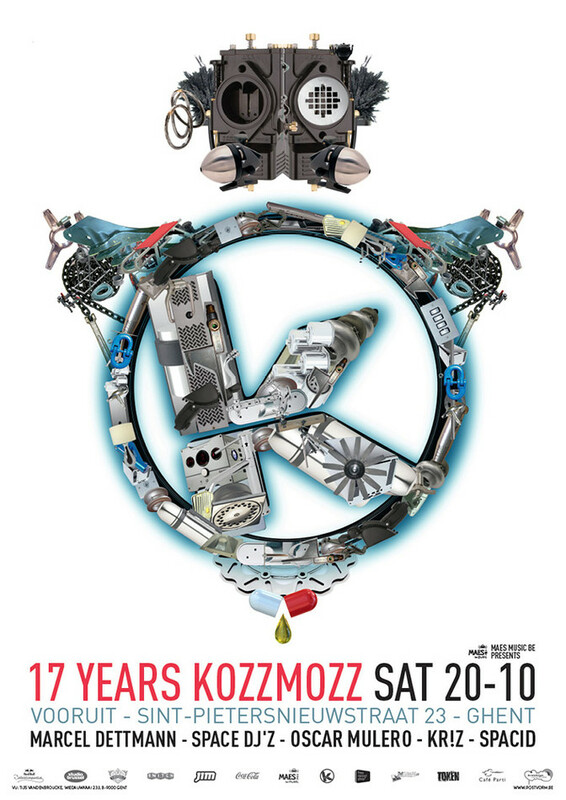 The last couple of years at Vooruit have seen Kozzmozz explode again with enthousiastic techno fans, both new and old ones and we’d like to treat you all to some new and old techno music brought to you by absolute rulers in the field. One of the new techno-kings is without a doubt Marcel Dettmann who has been spearheading the famous Berghain sound from the legendary club with the same name. He has been a resident there since the very beginning and next to his productions on Ostgut Ton ( amongst which his debut album: Dettman), he runs the critically acclaimed Marcel Dettmann Records on which he produced several great tracks that will be edged into the history of techno for many years to come. Next up, hailing from Madrid, is Oscar Mulero, the undisputed techno-king of Spain. He celebrated his 20 years as dj two years again and the 10th anniversary of his Warm Up label this year which is still going strong as a bomb with over 30 releases to date. About as long in the business as him, are the Space Dj’z who have been true innovators since the beginning with prolific releases dating back as far as 1995 and spanning to today. Next to running 7 labels themselves amongst which Potential Recordings, Ground, Foundation and Target, they have produced for about any leading techno label around. They have recently turned their sets into a 8 x 2 experience instead of 4 x 2. Prepare to be amazed! The three top notch international slammers, will be joined by our residents Kr!z and Spacid. Come and check them out on this anniversary edition and join us for a true techno fest like back in the days. All the artists will treat you to especially for Kozzmozz designed sets with both timeless classics as well as future hits. Earthlings, let go and surrender to the masters of the universe. The peace-loving beings from planet K !